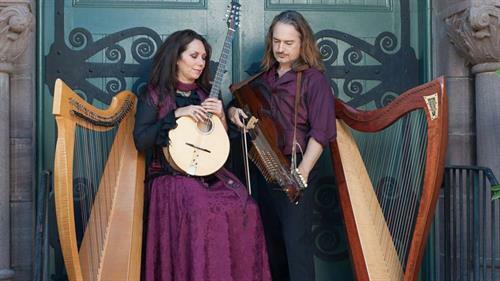 Lisa Lynne & Aryeh Frankfurter perform with two Celtic harps, the rare Swedish Nyckelharpa, Ukrainian Bandura, Cittern and more. The audience will hear Traditional instrumental music from Sweden and Ireland as well as heartwarming original compositions. They will present an eclectic blend of music and tales from their adventures as modern day troubadours. Lisa Lynne is a multi-instrumentalist and performer who has gained worldwide recognition for her original music featuring her Celtic Harp. She is acclaimed for composing memorable and heartwarming melodies on the Windham Hill/Sony music labels that have repeatedly placed in the Top 10 & Top 20 on the Billboard New age music charts. Lisa tours year round performing at large US festivals and performing art centers. Her work in Therapeutic music has gained recognition from NBC, CNN, and numerous newspaper and magazine articles including Wall Street Journal. Lisa’s music is heard throughout the award-winning PBS special “Alone in the Wilderness,” amongst many other soundtracks for commercial television and independent films. She was recently named one of the 50 most inspiring women by Los Angeles Magazine. Aryeh Frankfurter is a renowned Celtic harper and multi-instrumentalist who went from virtuosic progressive rock violin to intricate Swedish folk and Celtic Music. He began with the Classical violin at the age of three and studied music throughout his life. He has 17 albums to his credit, works on film and television scores as composer and arranger, and continues to teach himself to play a variety of instruments most recently the rarely seen Swedish Nyckelharpa. He earned his masters in philosophy as he was becoming one of the most successful street performers in the US. He is a full-time musician and producer whose uncommon approach to the Celtic harp and folk harp repertoire, his critically acclaimed albums have earned him high regard as an artist of extraordinary talents and abilities.